حسینی آب بندانک, سیدنوید, سیادتی, سید محمد حسین, اسلامی فارسانی, رضا. (1397). اثر نانوصفحات گرافن عامل‌دار بر رفتار خمشی کامپوزیت اپوکسی/ الیاف بازالت. 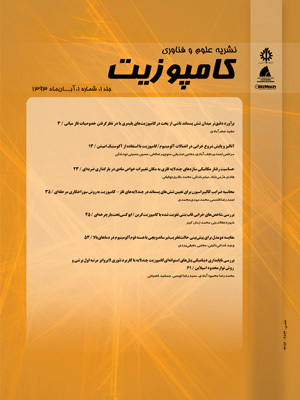 علوم و فناوری کامپوزیت, 5(3), 315-324. سیدنوید حسینی آب بندانک; سید محمد حسین سیادتی; رضا اسلامی فارسانی. "اثر نانوصفحات گرافن عامل‌دار بر رفتار خمشی کامپوزیت اپوکسی/ الیاف بازالت". علوم و فناوری کامپوزیت, 5, 3, 1397, 315-324. حسینی آب بندانک, سیدنوید, سیادتی, سید محمد حسین, اسلامی فارسانی, رضا. (1397). 'اثر نانوصفحات گرافن عامل‌دار بر رفتار خمشی کامپوزیت اپوکسی/ الیاف بازالت', علوم و فناوری کامپوزیت, 5(3), pp. 315-324. حسینی آب بندانک, سیدنوید, سیادتی, سید محمد حسین, اسلامی فارسانی, رضا. اثر نانوصفحات گرافن عامل‌دار بر رفتار خمشی کامپوزیت اپوکسی/ الیاف بازالت. علوم و فناوری کامپوزیت, 1397; 5(3): 315-324. در این پژوهش، اثر نانوصفحات گرافن عامل‌دار بر خواص خمشی کامپوزیت اپوکسی/ الیاف بازالت مطالعه شده است. گرافن توسط عامل سیلانی تری‌آمینوپروپیل تری‌متوکسی‌سیلان عامل‌دار شد و چهار نانوکامپوزیت با درصدهای وزنی مختلف گرافن عامل‌دار (0.2، 0.3، 0.4 و 0.5) به روش لایه‌گذاری دستی ساخته شدند. در میان این چهار نمونه، نانوکامپوزیت حاوی 0.4% وزنی گرافن عامل‌دار بهترین رفتار خمشی را نشان ‌داد. جهت بررسی اثر وجود گرافن و همچنین عامل‌دار کردن گرافن، دو کامپوزیت دیگر یکی فاقد گرافن و دیگری حاوی 0.4% وزنی گرافن بدون‌عامل نیز ساخته شدند. در مقایسه با نمونه فاقد گرافن، نانوکامپوزیت حاوی 0.4% وزنی گرافن عامل‌دار به ترتیب 89.6، 252.6 و 44.6 درصد افزایش در استحکام خمشی، مدول خمشی و انرژی شکست از خود نشان داد، اما نانوکامپوزیت حاوی 0.4% وزنی گرافن بدون‌عامل، به ترتیب 26.2 و 10.8 درصد کاهش در استحکام خمشی و انرژی شکست نشان داد، گرچه مدول خمشی آن به مقدار 3.1 درصد افزایش داشت. نتایج نشان دادند که عامل‌دار کردن گرافن باعث توزیع مناسب‌تر آن در زمینه و لذا برهمکنش بیشتر آن با زمینه و الیاف شده و در نتیجه باعث بهبود خواص نانوکامپوزیت شده است. مطابق با آنالیز طیف‌سنجی مادون قرمز، بهبود در خواص خمشی ناشی از حضور گروه‌های عاملی بر روی سطح گرافن می‌باشد که امکان چسبندگی آن‌ها را به مولکول‌های پلیمری و الیاف بازالت افزایش می‌دهد. همچنین مشاهدات میکروسکوپ الکترونی روبشی نشان‌دهنده چسبندگی بهتر پلیمر به الیاف و مکانیزم‌های چقرمه‌سازی مانند انحراف ترک، تورق لایه‌های گرافن و قفل شدن ترک در حضور گرافن‌ عامل‌دار بر روی سطح شکست می‌باشد. The effects of functionalized graphene nanoplatelets (FGN) on the flexural properties of basalt fibers/epoxy composites were studied. The functionalization of graphene was performed by 3-Aminopropyltrimethoxysilane. Four nanocomposites with different weight percentages of FGN (0.2, 0.3, 0.4 and 0.5) were fabricated via hand lay-up method. Among these four, the nanocomposite reinforced by 0.4 wt.% FGN showed the best flexural behavior. To investigate the effects of graphene as well as its functionalization, two other composites one without graphene and another reinforced by 0.4 wt.% of unfunctionalized graphene nanoplatelets (UFGN) were also fabricated. In comparison to the sample without graphene, the nanocomposite with 0.4 wt.% of FGN showed respectively 89.6, 252.6 and 44.6 percent improvements in the flexural strength, flexural modulus and fracture energy, but the nanocomposite with 0.4 wt.% UFGN showed respectively 26.2 and 10.8 percent decrease in the flexural strength and fracture energy, although had a slight increase of 3.1 percent in the flexural modulus. These results indicated that functionalization facilitated the dispersion of graphene in the matrix and thus enhanced its interaction to both matrix and basalt fibers. According to the Fourier transform infrared spectroscopy results, the improvement in the flexural properties is related to the functional groups whose presence on the graphene platelets enhanced better adherence to the polymer’s molecules and the basalt fibers. Furthermore, scanning electron microscopy observations of the fracture surfaces showed better polymer to fiber interfacial adhesion and thus caused toughening mechanisms such as crack deflection, graphene delamination and crack pining in the FGN containing samples. Lee, C. Wei, X. Kysar, J. W. and Hone, J., “Measurement of the Elastic Properties and Intrinsic Strength of Monolayer Graphene“ science, Vol. 321, No. 5887, pp. 385-388, 2008. Paul, D. and Robeson, L. M., “Polymer Nanotechnology: Nanocomposites“ Polymer, Vol. 49, No. 15, pp. 3187-3204, 2008. Goettler, L., Lee, K. and Thakkar, H., “Polym Rev 2007, 47, 291“ CrossRef| CAS| Web of Science® Times Cited, Vol. 13. Gao, L. Zhou, X. and Ding, Y., “Effective Thermal and Electrical Conductivity of Carbon Nanotube Composites“ Chemical Physics Letters, Vol. 434, No. 4, pp. 297-300, 2007. Liu, W. Hoa, S. V. and Pugh, M., “Fracture Toughness and Water Uptake of High-Performance Epoxy/Nanoclay Nanocomposites“ Composites Science and Technology, Vol. 65, No. 15, pp. 2364-2373, 2005. Boo, W. Sun, L. Liu, J. Clearfield, A. Sue, H. J. Mullins, M. and Pham, H., “Morphology and Mechanical Behavior of Exfoliated Epoxy/Α-Zirconium Phosphate Nanocomposites“ Composites science and technology, Vol. 67, No. 2, pp. 262-269, 2007. Ma, P. C. Siddiqui, N. A. Marom, G. and Kim, J. K., “Dispersion and Functionalization of Carbon Nanotubes for Polymer-Based Nanocomposites: A Review“ Composites Part A: Applied Science and Manufacturing, Vol. 41, No. 10, pp. 1345-1367, 2010. Wang, Z. Colorad, H. A. Guo, Z. H. Kim, H. Park, C. L. Hahn, H. T. Lee, S. G. Lee, K. H. and Shang, Y. Q., “Effective Functionalization of Carbon Nanotubes for Bisphenol F Epoxy Matrix Composites“ Materials Research, Vol. 15, No. 4, pp. 510-516, 2012. Cui, L. J. Wang, Y. B. Xiu, W. J. Wang, W. Y. Xu, L. H. Xu, X. B. Meng, Y. Li, L. Y. Gao, J. and Chen, L.-T., “Effect of Functionalization of Multi-Walled Carbon Nanotube on the Curing Behavior and Mechanical Property of Multi-Walled Carbon Nanotube/Epoxy Composites“ Materials & Design, Vol. 49, pp. 279-284, 2013. Yasmin, A. and Daniel, I. M., “Mechanical and Thermal Properties of Graphite Platelet/Epoxy Composites“ Polymer, Vol. 45, No. 24, pp. 8211-8219, 2004. Madhukar, M. S. and Drzal, L. T., “Fiber-Matrix Adhesion and Its Effect on Composite Mechanical Properties: I. Inplane and Interlaminar Shear Behavior of Graphite/Epoxy Composites“ Journal of Composite Materials, Vol. 25, No. 8, pp. 932-957, 1991. Rafiee, M. A. Rafiee, J. Wang, Z. Song, H. Yu, Z. Z. and Koratkar, N., “Enhanced Mechanical Properties of Nanocomposites at Low Graphene Content“ ACS nano, Vol. 3, No. 12, pp. 3884-3890, 2009. Miller, S. G. Bauer, J. L. Maryanski, M. J. Heimann, P. J. Barlow, J. P. Gosau, J. M. and Allred, R. E., “Characterization of Epoxy Functionalized Graphite Nanoparticles and the Physical Properties of Epoxy Matrix Nanocomposites“ Composites Science and Technology, Vol. 70, No. 7, pp. 1120-1125, 2010. Chiang, C. L. and Hsu, S. W., “Synthesis, Characterization and Thermal Properties of Novel Epoxy/Expandable Graphite Composites“ Polymer International, Vol. 59, No. 1, pp. 119-126, 2010. Rafiee, M. A. Rafiee, J. Srivastava, I. Wang, Z. Song, H. Yu, Z. Z. and Koratkar, N., “Fracture and Fatigue in Graphene Nanocomposites“ small, Vol. 6, No. 2, pp. 179-183, 2010. Ahmadi-Moghadam, B. Sharafimasooleh, M. Shadlou, S. and Taheri, F., “Effect of Functionalization of Graphene Nanoplatelets on the Mechanical Response of Graphene/Epoxy Composites“ Materials & Design, Vol. 66, pp. 142-149, 2015. Dhand, V. Mittal, G. Rhee, K. Y. Park, S. J. and Hui, D., “A Short Review on Basalt Fiber Reinforced Polymer Composites“ Composites Part B: Engineering, Vol. 73, pp. 166-180, 2015. Eslami-Farsani, R. Reza Khalili, S. M. and Najafi, M., “Effect of Thermal Cycling on Hardness and Impact Properties of Polymer Composites Reinforced by Basalt and Carbon Fibers“ Journal of Thermal Stresses, Vol. 36, No. 7, pp. 684-698, 2013. Daghigh, V. Khalili, S. and Farsani, R. E., “Creep Behavior of Basalt Fiber-Metal Laminate Composites“ Composites Part B: Engineering, Vol. 91, pp. 275-282, 2016. Lopresto, V. Leone, C. and De Iorio, I., “Mechanical Characterisation of Basalt Fibre Reinforced Plastic“ Composites Part B: Engineering, Vol. 42, No. 4, pp. 717-723, 2011. Kamar, N. T. Hossain, M. M. Khomenko, A. Haq, M. Drzal, L. T. Loos, A., “Interlaminar reinforcement of glass fiber/epoxy composites with graphene nanoplatelets, Composites Part A“ Applied Science and Manufacturing, Vol. 70, pp. 82-92, 2015. Bulut, M., “Mechanical Characterization of Basalt/Epoxy Composite Laminates Containing Graphene Nanopellets“ Composites Part B: Engineering, Vol. 122, pp. 71-78, 2017. Coates, J., “Interpretation of Infrared Spectra, a Practical Approach“ Encyclopedia of analytical chemistry, 2000. Pathak, A. K., Borah, M., Gupta, A., Yokozeki, T. and Dhakate, S. R., “Improved Mechanical Properties of Carbon Fiber/Graphene Oxide-Epoxy Hybrid Composites“ Composites Science and Technology, Vol. 135, pp. 28-38, 2016. Davim, J. P. and Reis, P., “Study of Delamination in Drilling Carbon Fiber Reinforced Plastics (Cfrp) Using Design Experiments“ Composite structures, Vol. 59, No. 4, pp. 481-487, 2003. Choi, N., Kinloch, A. and Williams, J., “Delamination Fracture of Multidirectional Carbon-Fiber/Epoxy Composites under Mode I, Mode Ii and Mixed-Mode I/Ii Loading“ Journal of Composite Materials, Vol. 33, No. 1, pp. 73-100, 1999. Quaresimin, M., Schulte, K., Zappalorto, M. and Chandrasekaran, S., “Toughening Mechanisms in Polymer Nanocomposites: From Experiments to Modelling“ Composites Science and Technology, Vol. 123, pp. 187-204, 2016.